The intersection of Bayou Lafourche and the Gulf Intracoastal Waterway at Larose, Louisiana. View is to the east-southeast. The bayou runs off towards the Gulf at the top. The waterway crosses the picture left–right. The U.S. Army Corps of Engineers has installed a floodgate on the bayou, visible at center. The name Lafourche is from the French for "the fork",  and alludes to the bayou's large outflow of Mississippi River water. 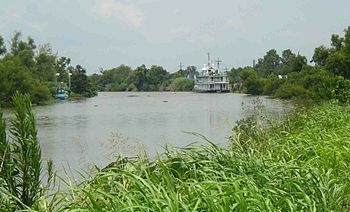 The first settlements of Acadians in southern Louisiana were near Bayou Lafourche and Bayou des Écores, which led to a close association of the bayou with Cajun culture. The Bollinger Shipyards, founded by Donald G. Bollinger, was launched on Bayou Lafourche in 1946. A project to reconnect Bayou Lafourche to the Mississippi River at Donaldsonville is under design. The plan is to use a control structure to regulate the water discharge. The purpose is to mitigate the accelerated land loss that followed the interruption of the distributary flow, and to improve water quality in the bayou. The film Southern Comfort is set on Bayou Lafourche. In The CW Network's supernatural-fantasy series, The Originals, the Bayou Lafourche is a major setting and has acted as the home of the Werewolf encampments for decades after the Vampires exiled them from the city of New Orleans. In the film Hard Target, the lead character Chance Boudreaux, played by Jean-Claude Van Damme, is a Cajun from Bayou Lafourche in Southern Louisiana. ^ Christopher G. Peña (2004). Scarred by War: Civil War in Southeast Louisiana. AuthorHouse. pp. 14–. ISBN 978-1-4184-5544-6. ^ Carl A. Brasseaux (2011). Acadiana: Louisiana's Historic Cajun Country. Louisiana State University Press. pp. 105–. ISBN 978-0-8071-3723-9. ^ Martin Reuss (2 June 2004). Designing the Bayous: The Control of Water in the Atchafalaya Basin, 1800-1995. Texas A&M University Press. pp. 90–. ISBN 978-1-60344-632-7. ^ Louisiana Department of Culture, Recreation and Tourism. "Bayou Lafourche Historical Marker". ^ "Mississippi River Reintroduction Into Bayou Lafourche (Deauthorized) (BA-25b)". Louisiana Coastal Wetlands Planning Protection and Restoration Act Program. Retrieved 2014-07-18. ^ W.J. Mitsch (23 December 2005). Wetland Creation, Restoration, and Conservation: The State of Science. Newnes. pp. 256–. ISBN 978-0-08-093126-5. ^ Bukowski, Charles (2009). Post Office. London: Virgin Books. p. 155. ISBN 9780753518168. OCLC 767984111.